I was recently asked by a fellow Liverpool fan this question which I think is one that we would all like an answer to and that is where are the goals going to come from? The lack of goal scoring was one of our biggest problems last season with us only netting the ball 47 times even Blackburn managed to score more goals than us with 48. It makes you wonder what has happened since the Benitez days when in the 2008-09 season we scored 77 goals. The season ahead looks even scarier for our goal tally when you look who were our leading scorers last year, and who is still in the team. The top goal scorer of course was Luis Suarez with 11 which is not bad considering the number of matches he missed. Our second leading scorer was Craig Bellamy with 6 goals ( no longer at LFC) then comes Gerrard with 5 goals, followed by Andy Carroll with 4 goals (on loan to West Ham) Maxi Rodriguez 4 goals (no longer at LFC) Then there are Henderson, Skrtel, Adams and Kuyt of which the last two are no longer at Liverpool either. So as you can see it really is a dilemma for the club plus it is only a question of time before Suarez gets suspended again, as he just does not know when to shut up, and god forbid if he should become injured. 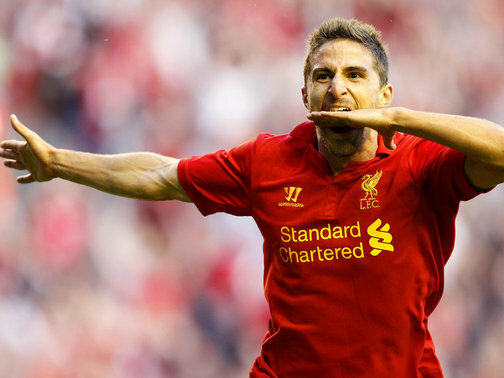 New signing Turkish International Nuri Sahin is a playmaker rather than a goal scorer, so I do not see to many goals coming from him which leaves our biggest hope resting on the shoulders of Fabio Borini who last season playing for Roma scored nine league goals in 20 starts at the Stadio Olimpico. The way I see it January cannot get here fast enough, and every club out there knows we need a striker, and is going to charge us a premium to get him.